I had to place orthodontic wax over the elastic knot since the sharp ends of the knot were digging into my lips; certainly making it unbearable to eat or speak =(… If it’s not one thing, it’s something else =(. At least I’m starting to feel a little better. Just had my lower braces tightened yesterday with elastic ligature changes. I’m a little disappointed that yesterday he left the upper braces alone. He said he was concerned about closing the bottom gaps and wanted to leave the uppers alone this visit. I really hope that my teeth will look nice at the end. No surprise that today my lowers are tender but thankfully not enough to need pain killers. I’m trying to treat them gingerly and eat soft foods or at least not rush through eating. 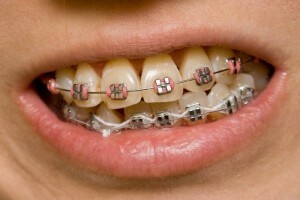 I wonder with all the advances in orthodontics why the process is still so painful? It’s hard enough on adults; I just can’t imagine how kids go through this? I mentioned to the dental hygienist, I noticed a little bleeding on my three front-most lower teeth recently (during my proxabrush cleanings). Dr. B said he didn’t see any gum inflammation at all. I was surprised that this happened after months of going through the same thorough routine. She told me hormonal changes could be the culprit and recommended rinsing with equal parts water and peroxide to resolve this issue.